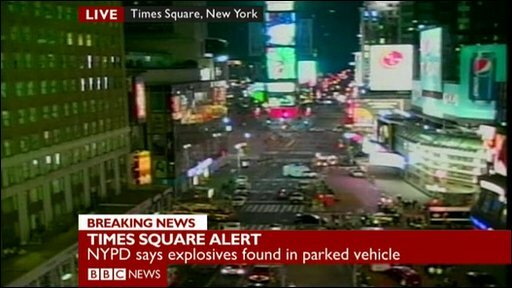 A car bomb has been discovered and safely defused in Times Square, the heart of New York's theatre district. Thousands of people were moved from the area, which had been teeming with Saturday evening crowds. BBC News website readers have been explaining what they saw in the area around Times Square. I was walking down 45th Street at about 1940 (2340 GMT) on my way to go and see a play. As I turned left off Times Square, police started cordoning off the area with yellow police ribbons behind us. In front of us, more police appeared, also closing off the street. The crowd on this busy street, the heart of New York's theatre world, was told to move along quickly; my friend was summoned by a policeman to run. We kept being pushed further and further on, towards 8th Avenue. Many of the people out on the street were theatregoers, on their way to see Broadway shows. Fire trucks started pulling up, and not long after the area had been cordoned off, a dull bang could be heard. Another, louder bang followed at about 2115 (0115 GMT). We were told this was the sound of water canons. Surprisingly everyone was very calm. By now, heavily armed police officers and police dogs had appeared on the scene. We were told that the majority of Broadway shows had been cancelled, but that in some venues around 44th and 45th street, audience members were not allowed out of the building. 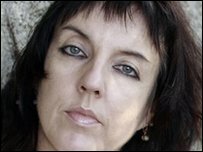 Apparently, these shows went ahead, but started with severe delays. 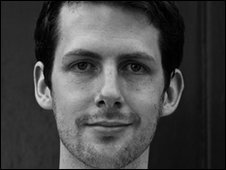 I am currently in New York as a theatre director, on an exchange programme between the Old Vic Theatre in London and New York's Public Theatre. They have now allowed some small batches of people to move along 46th street. There have been some announcements but you couldn't hear them because of the background traffic. There are still hundreds of people milling around at the entrance of 8th and 46, where I'm stood. Guests are sitting on the street and there is considerable chaos. There is talk about moving us to another hotel but I am not sure how this is going to happen because there are way too many people and no one has their baggage. We were actually at dinner when the bomb alert arose. 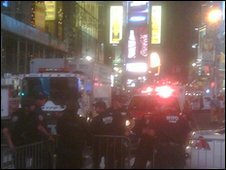 I was in Times Square at Minskoff Theatre 45th and Broadway as police started cordoning off the streets. The curtain for the show was being held one hour. Everyone was checking their iPhones for news; we learned about bomb - level one alert. But then the show went on. After the curtain calls, NYPD detectives came onstage to ask if anyone had seen anything. Open streets were packed but orderly. There were lots of police. From the theatre lobby window I observed an officer suiting up in hazmat gear. The crowd mood ranged from tense to oblivious.